Let's kick off another week with an early morning red post collection! 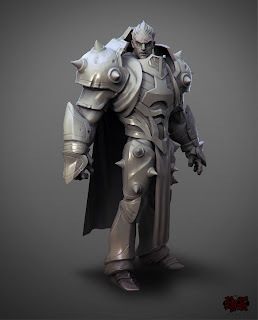 Continue reading for Roku's commentary on the upcoming LeBlanc changes, an update on the Oceanic server, a short discussion on forum update, a few more concept arts & models from Grumpy Monkey's forum thread, and more from ZenonTheStoic on his upcoming champion. Here is Roku with more commentary on the upcoming LeBlanc changes and thanking PBE members for their valuable input. "A big problem with Leblanc on live is that too much of her power resides in her Sigil of Silence - an ability that has very minimal counterplay. It is a targeted ability, her highest damage, can prevent her opponent from retaliating, and it combo's with itself after 6 (Mimic). Even with that said, we don't want to net nerf Leblanc. Instead, we want to spread that power throughout the rest of her kit - which increases both versatility and her opponent's potential to play against her. I'm not saying that she's perfectly balanced with these changes - but she is in a state that is more capable of being balanced in the future. It's a valid concern that we might not have redistributed an appropriate amount of power across her kit. I've been monitoring as much feedback on the changes as I possibly can to help gauge this. I'm especially curious of how players on PBE have felt playingagainst the changed Leblanc, in addition to the playing as. Also, I want to thank everyone for how passionate you've been with the changes and how much feedback you've given already. As a reminder though - try and keep discussions focused on the topics at hand. Once a thread gets hostile it makes it difficult to participate in the discussion." He also commented on another change he wants to test, tuning her E down from 10 sec to 8 for the next PBE update. "I agree, this is a change that I do want to test out. 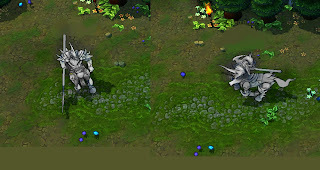 I'll try to make sure the next iteration for PBE has Ethereal Chains at an 8 second cooldown at rank 5." Master Mirkinen , the Oceania country manager, offered up an update on the upcoming Oceanic servers, mentioning that staffing is going well but that, unfortunately, the release skin will likely not be available in time for the server's release. Last week, 4 Rioters from the LA office and our new Oceanic Network Engineer (Forostie) started the local server build out. I'm not a techy person so I don't really know how to expand this without sounding like a proper noob but we now have almost everything we need to start the imaging and testing / QA of the local servers. There are still couple of missing pieces but they should arrive by the end of the week but this is a fundamental milestone for our project and I'm happy to share this with you. We now have 5 people in the office: myself, Loote (Project Manager), Forostie (Network Engineer), an Office Manager, and a eSport Coordinator (I don't have their Summoner name here with me). 2 other offer were made and been accepted for the 2 NOC position. One will start on the 5th of July and one on the 25th of July. We have also found a Payment Contractor who will work in HQ to put together the payment methods for Oceania. We have 3 people at advanced stage for System Administrator. We also have some good candidates for Front End /Back End Developer and Community. Overall I think we are in a very good place with hiring. I also wanted to share something regarding the skin for Oceania. I know that normally when we release a new territory, we do it with dedicated skins for that territory. Unfortunately here I failed. I've been trying to find a skin that would be culturally relevant for both Australia, New Zealand and all other countries included in the Oceanic region but I was not able. I therefore decided to wait for the Community Manager to lead this decision but because I haven't found one yet, I'm afraid we won't have a skin in time for our release. It normally takes 3-4 months to create a skin from the moment this is "thought / decided" so the choice was either to wait more time to release the platform or launch without a skin and work on the skin later on. I hope you agree with my choice to give priority to the platform and take more time to develop a skin once someone with more knowledge of the Oceanic region joins the team. Thanks again for all your questions, I've added to the FAQ we are preparing." For those frustrated with the LoL forums, here is Damiya with a reminder that a super early beta of a new forum system is currently being tested over on the new PBE community. "Good news! We have an awesome team of engineers working on new forums. Please note that it's still in progress, so there's a lot of changes and improvements that you're likely to see before we roll it out to the entire forums :)"
"The whole point of the new forums is to provide you guys with a better experience, and part of that commitment involves hearing and responding to your thoughts. While the overall direction is pretty set (I think), there's definitely room to adjust and tweak things to meet requests and feedback from you guys. For the record I'm not on that team, I'm just passionate about building bridges for communication between Riot and y'all :)"
"I'm going to touch base with some of the community guys tomorrow (since they're a primary customer and stakeholder in the new layout) and see if we can come up with a good way to solicit constructive feedback on the new layout from people without PBE accounts." Although she absolutely made no promises, Damiya also commented that she would see if there was any chance ot getting the team responsible for the new forums to do an AMA. That said, taking a somewhat educated guess, we already have the concept of upvotes and downvotes in the current system, so using that to help inform and stack rank the content in the forums makes sense to me. Again, just a guess"
Just like the other day, Grumpy Monkey has posted a few neat, early / concept images of a few of our favorite champions. First up is a couple of shots for Hecarim, followed by some of Darius. 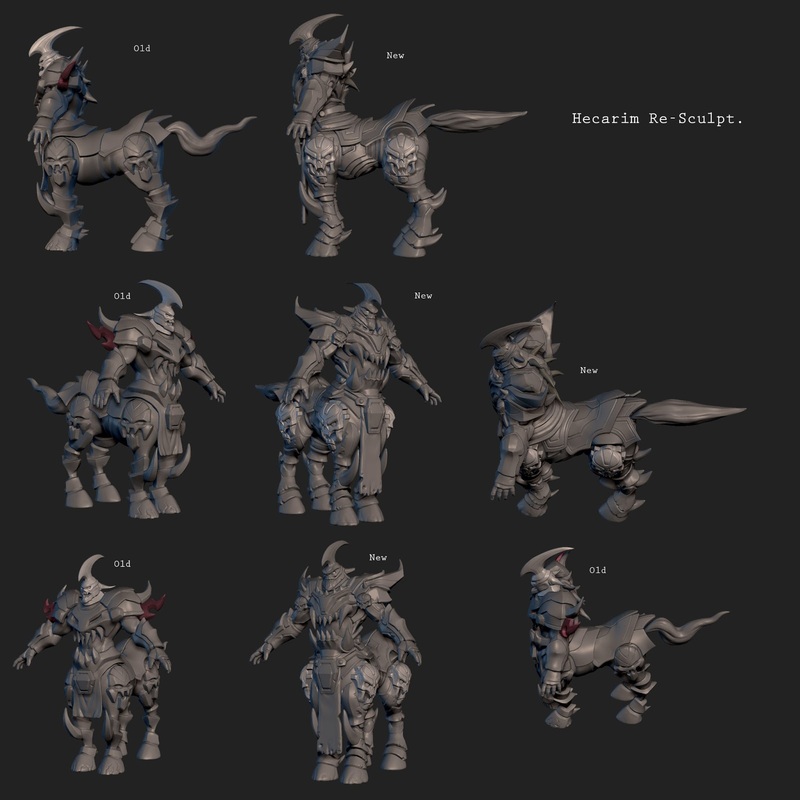 The first image is the first pass sculpt done by someone else, I grabbed it and pushed it a bit further. The mockup image is from a process we sometimes do for more complex characters. What I did was make a proxy model, put it in the game in a static action pose, then painted over it to get the proper detail management and proportions that would work best. It helps figure out what design elements are most important from our game camera angle, and allows us to manage the foreshortening that happens from the camera view." 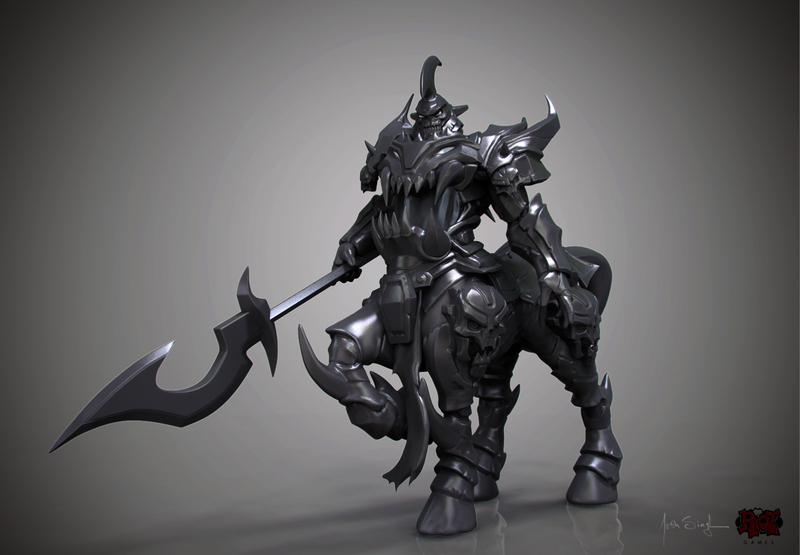 "I'll see what else I can dig up from these old hard drives on monday, but here are some Darius sculpts from his development:"
"His hook move, we wanted one side to be a razor sharp axe and the other a vicious hook." ZenonTheStoic left a few more comments about his upcoming champion over on the German forums. Hmm what else can I let you guys know...during production I have tried about 5 different ultimates, that all were bad, and had three different passives, one of the old, removed, passives was so fascinating since it turned league as we know it upside down but just didn't fit the theme of the champion. Maybe we will use it in the future on another champion, who knows. Ok, enough teasing for today :)"